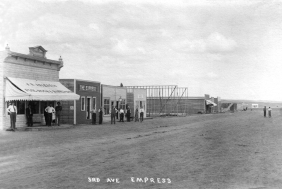 One two main business streets under construction in 1913 the year that the CPR opened the station in Empress. The owners of the Canadian Pacific Railway had big plans for Empress at the beginnning of the 20th century. It was going to be a large city,a railroad hub between Swift Current and Calgary that would serve the influx of economic migrants from Europe who had been offered free land. The CPR financed it's growth by creating towns along its right-of-way. In 1913 they opened a station, began construction of repair yards including a roundhouse, surveyed a town site that stretched for miles south of the tracks and put the bulk of the lots up for sale the following year. In April 1914 the Village of Empress was incorporated and the CPR auctioned the lots...some of which sold for as little as $10. In a single day the company collected more than $300,000 and a rosy future was in sight for the handful of entrepreneurs who were already selling lumber, cement, dry goods, livery and dray services and accommodation. Of course there was a Chinese restaurant as well as a Chinese laundry. The bubble burst a few months later when the First World War broke out. The momentum faltered. Nevertheless, Empress thrived as a village of 1200 or more folks who catered to the farming community. It just never fulfilled it's grandiose future as a railroad metropolis. 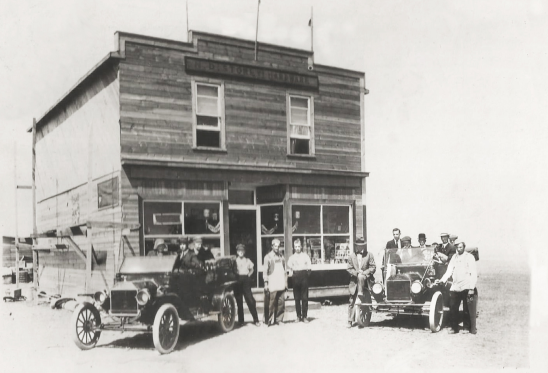 The hardware store was critical to everyone building homes and business in Empress in 1913. It wasn't until the Spring of 1939 that the CPR finally got working on second line into town. The plan was that the rails would run north-south. Today, if you walk to the north end of Centre Street and continue down through the camp grounds you can see the embankment that was constructed to support a new railroad bridge across the Red Deer River. In September the Second World War put a permanent end to railroad expansion on the prairies. Towns like this one began the slow decent into oblivion. It was because those industries that had geared up to build tanks during the war years began to build trucks after the war ended...at a pace and a price that every farmer could afford. There was no longer a need to have grain elevators dot the tracks every twenty five miles because a truck could travel further than a horse. A decade or more later the CPR closed their repair yard in Empress and knocked down the roundhouse. The bankers got cold feet and scarpered. One after another the other businesses floundered and the population shrunk to 150 (more or less) where its held steady for years. There's only one store left standing in the village and it's an art gallery! Here's a list of services available in the village these days.